Item number Ia272 from the MOA: University of British Columbia. A tall bulbous jar with wide, pie-crust shaped mouth, eight grooved lugs and relatively narrow flat base. The main body design is a wide band demarcated by cord-like borders. The motif within this band consists of two birds and two butterflies amidst two large sprays of peonies. Each spray has three large peonies, a few smaller ones and leaves. Each lug has a dao die mask design. The inside neck has an unidentified stamp. The lip has a set of inked numbers. 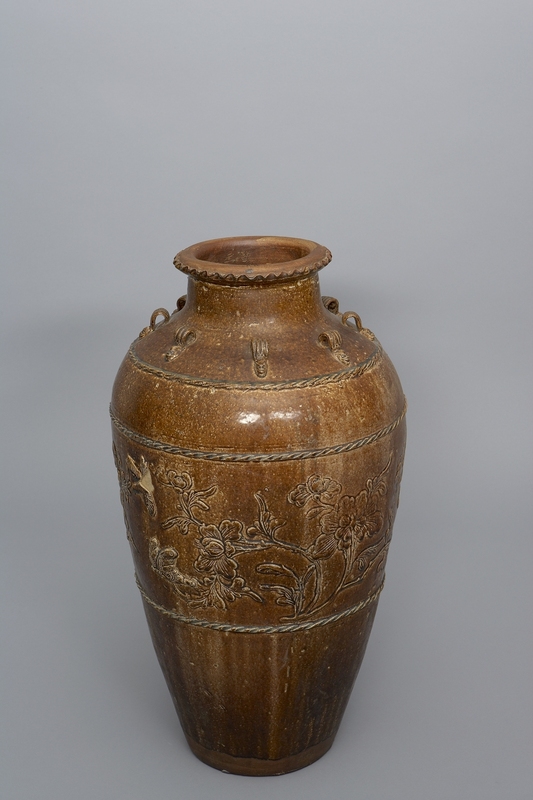 Chinese ceramics were important trade items in Southeast Asia during the 11th - 16th century C.E. 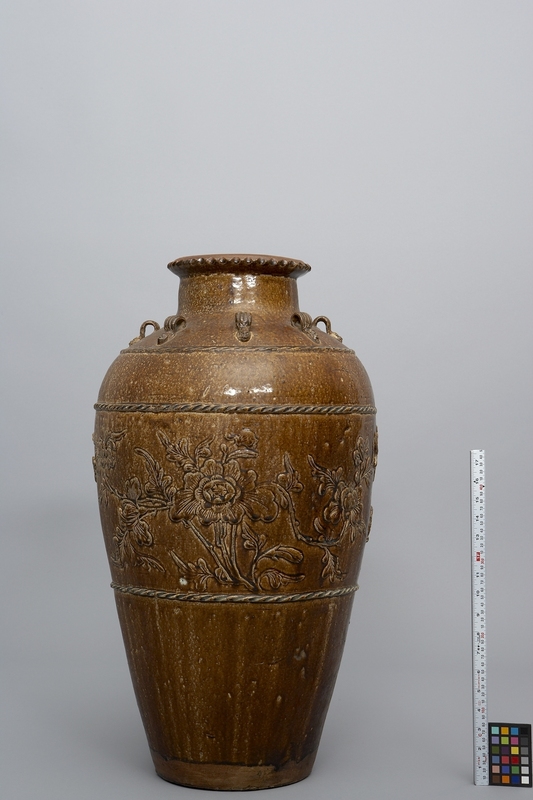 This jar was probably exported from China to the Philippines via the Burmese port of Martaban from which the generic name for large jars is derived. They are also referred to as dragon jars because they often, though not in this case, have a moulded dragon decoration on their sides. These pot-bellied jars were designed for long journeys at sea, with lugs big enough to pass a rope through and as containers for food, oil and water as well as for packing smaller porcelains. Besides China, Martaban jars were also manufactured in other parts of Southeast Asia such as Burma, Cambodia, Thailand and Vietnam and are still being manufactured today in parts of Asia. Due to their physical characteristics - resonance, vitreosity and durability - Chinese ceramics became fully integrated with the ideology and ritual in Philippine societies and played an important role in all aspects of cultural life (Langrick, p.61). Their functions were varied and included utilitarian, ceremonial, religious roles, as heirlooms, in mortuary ceremonies as burial goods and as items of prestige. Treasured for their supernatural powers, large jars were considered to harbour spirits or household gods while some spoke prophesying events. As heirlooms, large jars together with stories of their origins and other tales associated with them, often mythical and wondrous, were handed down from one generation to another. With age, jars increased in value and one's wealth was largely reflected in the number of old jars possessed. An heirloom piece, defined by Dr. Tecson as one never in the ground, hence different from an excavated piece, and not necessarily from his family. This piece is from Zamboanga del Sur, Mindanao Island, Philippines. Probably hand-built with clay rings of varying sizes. These were fused together by holding a mallet with a convex face against the inside surface of the jar and tapping gently with a concave mallet held against the outer surface. In many indigenous groups of the Philippines, supernatural power was attributed to Chinese ceramics because of the ringing sound emitted when lightly tapped and their vitreous, shiny glazed surfaces which impart an impermeable quality. The ringing sound was seen as a magical voice able to attract the attention of powerful ancestor spirits. Their impermeable and seemingly imperishable surfaces were believed to have great protective power against all kinds of influences, from evil spirits to poisons (Langrick, p. 55-56). Dao die is an animal mask motif of ancient Chinese origin. The animals depicted vary from dragon, feline, bovine, and indeterminate. In Chinese culture, a spray full with peonies and leaves is emblematic of good fortune. The peony is also emblematic of love and affection, a symbol of feminine beauty and represents spring. The butterfly symbolizes joy, summer and conjugal happiness.